This section includes a screen of the BIOS Boot Menu. The options that are available from the Boot Menu are described in the table that follows. Disable or enable automatic retries of the Boot List when all devices fail. If enabled, BIOS automatically retries the PXE list present in the system when all PXE attempts have failed. If set to disabled, the system halts and displays the error message “Network Boot Failed” when all PXE boots fail. 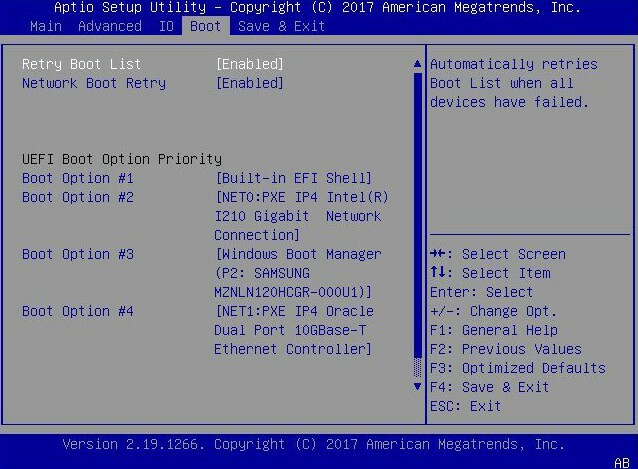 If set to Boot List, fail over to the main Boot Options Priority list. If disabled, system reverts back to the default boot handling from the next boot. If enabled, Persistent Boot Support allows you to fix the position of every physical slot, network port, and disk drive bay int eh boot order list, regardless of the presence of a bootable device at each location. Displays and sets the system boot order.